DR. TIM TRESIERRAS HAS JOINED ARCCA! 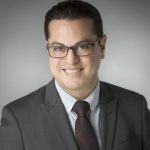 Dr. Tresierras is a Senior Engineer, and his areas of expertise include mechanical engineering, electro-mechanical systems, materials science, vibrational and acoustic analysis (e.g., measuring noise as it relates to human hearing), and prototype design. He is also experienced in investigating impacts, collisions, load and vibrational analysis on structures, the mechanical behavior of materials (e.g., stress analysis on parts, fatigue and wear), and the study of systems under the action of external forces (e.g., gear trains, appliances/machines, power transmissions). Tim’s previous experience includes teaching at both the University of California Berkeley and at the University of Miami. He has also worked with the U.S. Army in Afghanistan to solve complex multidisciplinary problems utilizing technologies in RF transmission, welding and fabrication, 3D printing, automated milling (CNC), computer networking, video/audio surveillance, programmable microcontrollers, batteries and basic circuitry. While he’s based in our Coral Springs, FL office, Tim is available to work on cases nationwide. For help with your next case or claim, contact Tim at ttresierras@arcca.com or by calling 833-888-8040 (toll-free).